You can’t blame me for being quite hesitant about visiting Hatched again. Portions were small, hardly enough for “brunch” status (brunch kinda entails that the portions must be hearty, enough for two meals right? hehe. ), leaving much to be desired especially for the prices paid. Previously I tried the pancakes, which traumatized me quite a bit. This time I decided to be a little smarter, and ordered Papillote, which actually garnered quite positive feedback the last time from the friends. It’s now like an up-sized version of the one the friend had in 2010, just compare the pictures! 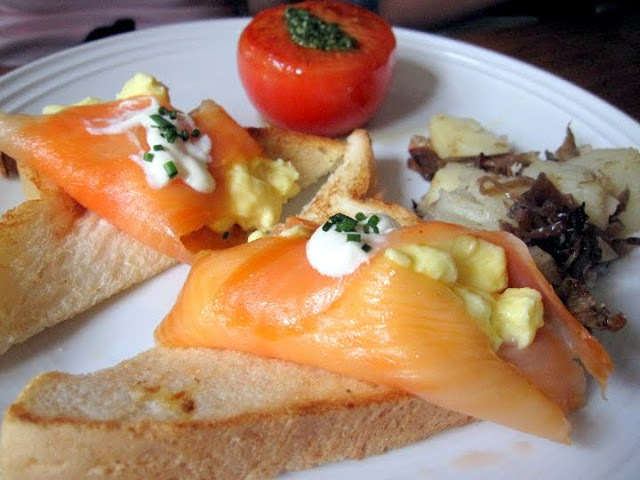 The scrambled eggs were overflowing out of the huge flavourful slabs of smoked salmon during my visit. There’s also more pesto on the grilled tomato, and look at the amount of potatoes on my plate! After reading hungrygowhere, I realise that prices have increased from $12 to $14. But for almost a 50% increase in the amount of food on the plate I really don’t mind paying that extra 2 bucks. The star of the plate, was rightly the scrambled eggs. Silky, and a little milky but not to the extent that you’ll feel sick thereafter. I liked the smoked salmon a lot as well because the saltiness wasn’t overwhelming at all, but just about right such that it accentuated the flavours of the eggs.